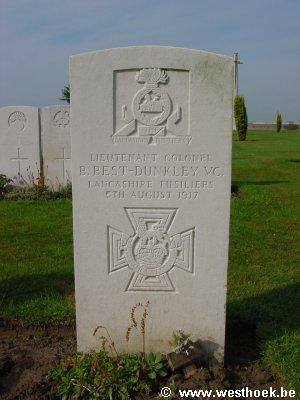 BEST-DUNKLEY, Lieutenant Colonel, BERTRAM, V C, Commanding 2nd/5th Bn. Lancashire Fusiliers. Died of wounds 5th August 1917. Age 27. 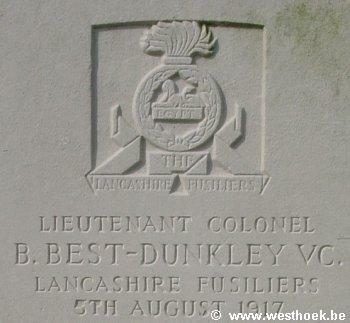 BEST-DUNKLEY, Lieutenant Colonel, BERTRAM, V C, Commanding 2nd/5th Bn. Lancashire Fusiliers. Died of wounds 5th August 1917. Age 27. Native of York. Mendinghem Military Cemetery III. D. 1. An extract from the London Gazette No. 30272, dated 4th Sept., 1917, records the following. "For most conspicuous bravery and devotion to duty when in command of his battalion, the leading waves of which, during an attack, became disorganised by reason of rifle and machine gun fire at close range from positions which were believed to be in our hands. Lt. Col. Best-Dunkley dashed forward, rallied his leading waves, and personally led them to the assault of these positions, which, despite heavy losses, were carried. He continued to lead his battalion until all their objectives had been gained. Had it not been for this officer's gallant and determined action it is doubtful if the left of the brigade would have reached its objectives. Later in the day, when our position was threatened, he collected his battalion headquarters, led them to the attack, and beat off the advancing enemy.